Visitors traveling to the National Capital Region for Major League Baseball’s 2018 All-Star Week will find affordable hotel rates, plus a myriad of all-star attractions and activities, in Fairfax County. Visit the home of America's first President. 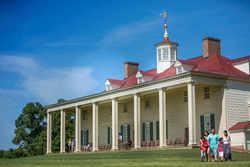 Fairfax County is home to several bucket list attractions, including the home of America’s Founding Father, George Washington. Visitors traveling to the National Capital Region for Major League Baseball’s 2018 All-Star Week will find affordable hotel rates, plus a myriad of all-star attractions and activities, in Fairfax County. All-Star Week in neighboring Washington, D.C. takes place July 13 through July 17, culminating in the Midsummer Classic on Tuesday, July 17. Here’s how visitors can create their own all-star vacation in the National Capital Region. Start the planning process at http://www.FXVA.com/baseball. Experience “major league” adventure at one of Fairfax County’s newest outdoor parks, Go Ape! Zip Line & Treetop Adventure. The site is offering 15% off all bookings through July 22, 2018. Beat the heat with a family visit to one of four themed waterparks or try some local Virginia wine at one of two award-winning Fairfax County wineries. Keep complete tabs on exciting summer events throughout All-Star Week by visiting http://www.FXVA.com/events. Can’t make it to the big game, but don’t want to miss the action? Many Fairfax County dining establishments will be airing the All-Star Game. Choose from hundreds of award-winning restaurants, lively sports pubs, or even some of the county’s independent craft breweries. To browse the array of dining experiences in Fairfax County, visit http://www.FXVA.com. Visit Fairfax is the official tourism organization for Fairfax County, Virginia. Charged with destination marketing and tourism promotion, it is directed by many of the County’s top tourism and hospitality leaders. Download the free app at http://www.FXVA.com/mobile.